Following a change in the environment or motor apparatus, human subjects are able to rapidly compensate their movements to recover accurate performance. This ability to adapt is thought to be achieved through multiple, qualitatively distinct learning processes acting in parallel. It is unclear, however, what the relative contributions of these multiple processes are during learning. In particular, long-term memories in such paradigms have been extensively studied through the phenomenon of savings—faster adaptation to a given perturbation the second time it is experienced—but it is unclear which components of learning contribute to this effect. Here we show that distinct components of learning in an adaptation task can be dissociated based on the amount of preparation time they require. During adaptation, we occasionally forced subjects to generate movements at very low preparation times. Early in learning, subjects expressed only a limited amount of their prior learning in these trials, though performance improved gradually with further practice. Following washout, subjects exhibited a strong and persistent aftereffect in trials in which preparation time was limited. When subjects were exposed to the same perturbation twice in successive days, they adapted faster the second time. This savings effect was, however, not seen in movements generated at low preparation times. These results demonstrate that preparation time plays a critical role in the expression of some components of learning but not others. Savings is restricted to those components that require prolonged preparation to be expressed and might therefore reflect a declarative rather than procedural form of memory. 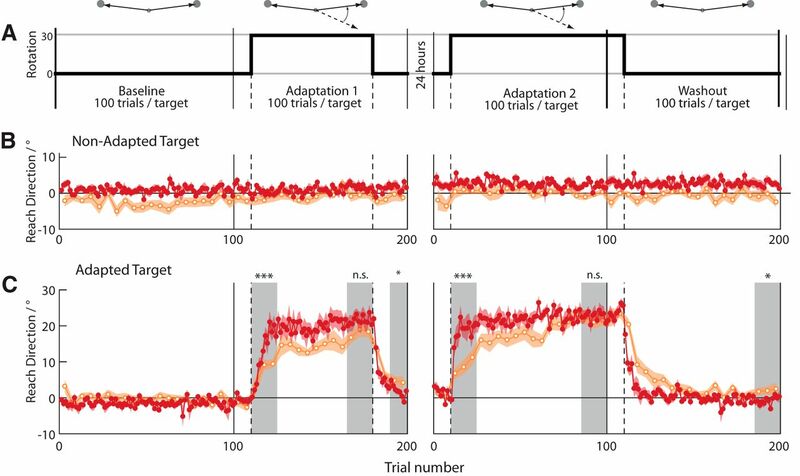 Motor learning is commonly studied through adaptation tasks in which subjects must learn to compensate for an imposed perturbation that disrupts their movements (for instance, a distortion of visual feedback; Krakauer et al., 2000). An important feature of behavior in these paradigms is that subjects readapt faster the second time they are exposed to a perturbation. This phenomenon, referred to as savings, is thought to reflect the formation of a long-term motor memory (Krakauer et al., 2005; Krakauer and Shadmehr, 2006) and thus potentially provides a critical link between learning in adaptation paradigms and other forms of motor skill acquisition. Learning in adaptation tasks is known to depend on an implicit (Mazzoni and Krakauer, 2006), cerebellum-dependent (Tseng et al., 2007; Synofzik et al., 2008; Taylor et al., 2010; Izawa and Shadmehr, 2011) learning process that is posited to reflect updating of an internal forward model (Wolpert and Miall, 1996; Bastian, 2006; Izawa et al., 2012) driven by sensory prediction errors (Mazzoni and Krakauer, 2006; Tseng et al., 2007; Synofzik et al., 2008). In addition to this implicit, error-driven process, multiple additional processes are thought to contribute to learning in adaptation paradigms (Smith et al., 2006; Huang et al., 2011; Haith and Krakauer, 2013; Taylor and Ivry, 2014). In particular, explicit cognitive strategies can account for a significant amount of learning, particularly during early exposure (Redding and Wallace, 1996; Keisler and Shadmehr, 2010; Benson et al., 2011; Fernandez-Ruiz et al., 2011; Taylor et al., 2014). Characterizing the properties of individual components of adaptation is challenging, since only the summed contribution of all of these components can typically be observed. Here, we sought to dissociate components of learning based on their preparation time requirements. Reaction times are known to increase during visuomotor adaptation (Saijo and Gomi, 2010; Fernandez-Ruiz et al., 2011). Furthermore, this increase is causally related to adaptation rate (Fernandez-Ruiz et al., 2011) and is thought to reflect additional time required for cognitive contributions to influence movement. Previous work has also shown that movements released at low reaction times through startle (Valls-Solé et al., 1999) show reduced expression of prior motor learning (Wright et al., 2009, 2011). We show how carefully controlling the amount of time available to subjects to prepare their movement on a trial-to-trial basis allows us to decompose their learning into constituent components. We identified one component of learning that is expressible at minimal preparation time and appears to reflect implicit learning driven by sensory prediction errors. A further component of learning could only be expressed given prolonged preparation times. We speculate that this process reflects cognitive contributions to learning. This precise trial-by-trial control over the expression of different components of learning allowed us to directly test which component of learning is responsible for savings upon re-exposure to the same perturbation. A total of 24 human subjects (11 women, 13 men; aged 24.6 ± 7.5 years) participated in this study (10 in Experiment 1 and 14 in Experiment 2). All participants had no known neurological disorder and provided written consent before participation. All procedures were approved by the Johns Hopkins University School of Medicine Institutional Review Board. Participants sat in front of a glass-surfaced table with their right arm supported on an air sled to allow frictionless planar movement. A mirrored display presented targets and a cursor controlled by the hand in the plane of movement. Hand position was tracked at 130 Hz using a Flock of Birds magnetic tracking device (Ascension Technologies). Subjects began each trial by moving to a central start location. A target then appeared in one of two possible locations, ±82.5° from the straight-ahead direction, at a distance of 8 cm from the start position (Fig. 1A). A sequence of four tones, each spaced 500 ms apart, was initiated as the target appeared. Subjects were instructed that, synchronously with the fourth tone, they should initiate a rapid movement of the hand to move the cursor through the target. When the cursor passed the target radius, it was extinguished and reappeared when the subject's hand came within a 2 cm radius of the start position when returning to begin the next trial. Subjects were provided feedback about the timing of their movement initiation relative to the fourth tone. Successfully timed movements had to be initiated within ±100 ms of the fourth tone. On-screen text informed subjects if they had initiated their movement “Too Early” or “Too Late.” Other than observing the trajectory of the cursor, subjects did not receive any overt feedback about whether their movement successfully hit the target. Before the main experiment, subjects completed 400 trials of training (200 to each target, over two blocks) in the basic task to practice accurate timing of their movement initiation. After this initial training, subjects performed a calibration block. In this block the target occasionally (30% of trials) switched from one location to the other at a random time before the onset of the fourth tone, chosen uniformly between 200 and 500 ms. Subjects were instructed to prioritize the timing of their movement initiation but at the same time to also make an effort to hit the target when possible. Based on subject performance in this block, we estimated the minimum response time each individual subject would require to successfully compensate for the target switch. We used maximum likelihood estimation to fit a sigmoid to the relationship between reaction time (measured as the time between target jump and movement onset) and reach direction. This threshold was rounded up to the nearest 25 ms to obtain a subject-specific switch time for all subsequent trials in which the target switched. After completion of initial training, we imposed two trial types on subjects (Fig. 1B). In 80% of all trials, the target appeared at the time of the first tone and remained in the same place for the duration of the trial. Subjects therefore had 1.5 s to prepare their movement from the time of initial target presentation to the time of movement initiation. We refer to these trials as high preparation time (highPT) trials. In the other 20% of trials, the target switched locations shortly before movement initiation. The purpose of this late target switch was to force subjects to make a movement toward the new target with a minimal amount of preparation time. We refer to these trials as low preparation time (lowPT) trials. The timing of the target switch was determined based on each subject's individual performance in the earlier calibration block, such that subjects would only just be able to react to the target switch. Experiment 1 examined the effects of preparation time on subjects' ability to compensate for an imposed visuomotor rotation. Ten subjects participated in Experiment 1. Following initial training and calibration, each subject performed three blocks: Baseline, Adaptation, and Washout (Fig. 1C). Each block consisted of 100 trials to each target. The trial order was organized as a series of 10-trial sub-blocks, with each sub-block containing eight highPT trials (four to each of the two potential target locations) and two lowPT trials (one to each target), arranged in a pseudorandom order. Each subject received a different, randomly generated sequence of trials (using the randperm function in MATLAB). All trial numbers reported henceforth refer to trials to a particular target, rather than to the actual trial number within the block. During the Adaptation block, a 30° clockwise rotation of the cursor position was imposed on the left half of the workspace at the start of trial 11. The perturbation was switched off at the start of trial 11 of the Washout block and remained off for the rest of the experiment. Experiment 2 examined whether learning expressed in either highPT or lowPT trials would be faster upon a second exposure to the perturbation (i.e., whether savings would occur). Fourteen subjects participated in Experiment 2. This experiment was conducted over 2 d. On Day 1, subjects performed initial training plus two experimental blocks: Baseline and Adaptation 1. On Day 2, subjects performed two further blocks: Adaptation 2 and Washout (Fig. 2A). Each block consisted of 100 trials to each target, and the sequence of trial types was structured in the same way as in Experiment 1. In a preliminary study (data not shown), we found that subjects had persistent aftereffects (∼10°) when returning after 24 h. This partial retention of learning across days means that baseline behavior is poorly matched across days, making it difficult to assess changes in the rate of learning across exposures (savings). We therefore introduced a brief period of washout at the end of Day 1 (last 20 trials). On Day 2, the perturbation was switched off during the first 10 trials and was reintroduced at the start of trial 11 of Adaptation 2. As in Experiment 1, the perturbation was on for the first 10 trials of the Washout block, and was then switched off for the remainder of the experiment. The specific sequence of trial types (i.e., left/right, highPT/lowPT) that each subject experienced in Adaptation 2 was identical to Adaptation 1; these blocks differed only in that the cursor rotation was switched off toward the end of Adaptation 1. Finally, to ensure that the effects observed in Experiment 1 were not the result of biomechanical asymmetries, the overall experiment was reflected across the midline such that a 30° counterclockwise rotation was now introduced in the right half of the workspace. Position data were filtered using a Savitzky–Golay filter (second order, half-width 54 ms) and differentiated to obtain velocity. We identified the time of movement onset as the first time at which the tangential velocity of the hand exceeded 0.02 m/s. The initial reach direction was calculated as the direction of the smoothed tangential velocity vector 100 ms after movement onset. We compared behavior between lowPT and highPT trials with paired, two-tailed t tests on the mean reach direction for each trial type across subjects within a particular window of trials. We averaged performance over a window of 15 trials to a specific target (12 highPT, 3 lowPT; with one exception: we considered a window of just 10 trials to assess washout at the end of block Adaptation 1 in Experiment 2). To assess savings in Experiment 2, we quantified the rate of initial learning as the difference between behavior in the last 5-trial bin before the onset of the perturbation and the first 5-trial bin after the onset of the perturbation. We quantified savings as the difference in this learning rate between days. The specific trial windows used for each test, which were determined a priori, are described in Results and are indicated by shaded gray regions in each figure. In lowPT trials, subjects occasionally failed to move to the correct postswitch target. We deemed a trial to be a “miss” if subjects moved >2 cm in the direction opposite the target. Such miss trials were an inevitable consequence of switching the target as late as subjects could cope with. These miss trials were excluded from further analysis. One subject in Experiment 1 and two subjects in Experiment 2 missed the target switch in more than half of the lowPT trials. Data from these subjects were excluded from subsequent analysis. In addition, the remaining subjects were excluded from specific statistical comparisons if they missed the target switch on all trials of interest for that particular comparison. At most one subject was excluded from each statistical comparison on these grounds (though not always the same subjects). Of the remaining subjects, 14.1% of pertinent lowPT trials (i.e., those that would have contributed to a statistical analysis) were unavailable due to “misses” in Experiment 1. This figure was 11.5% for Experiment 2. Miss trials were uniformly distributed across subjects, trial windows, and locations within each window. Since the learning rate analysis necessarily included a smaller number of trials, a greater number of subjects (four) were excluded from this analysis. The basis for excluding data—that subjects missed the switch in target locations on these trials—is independent of their exact reach direction when they moved toward the correct target. Therefore our analysis is unlikely to be biased by considering only a subset of the data. Shapiro–Wilk tests on data from 34 subjects across all experiments confirmed that mean reach directions used in statistical tests were normally distributed across subjects in both trial types, during both early learning (trials 1–15) and at asymptote (trials 51:75; p > 0.2 in all cases). Variability across subjects was similar across trial types at all points during learning, although slightly larger in highPT than lowPT trials during early learning (5.8° vs 3.3° SD). The variances could be equalized through a log-transformation of the data, in which case the outcome of all statistical tests remained similar to the analysis of the untransformed data. We sought to dissociate components of motor learning based on the amount of time available for subjects to prepare a movement. Subjects made fast reaching movements to guide a cursor through a target that was presented either to the left or right of a central start location (Fig. 1A). We varied preparation time by using two distinct types of trial (Fig. 1B). In 80% of trials, subjects were allowed a high preparation time (highPT trials). In these trials, the location of the target was revealed 1.5 s before subjects were required to initiate movement and remained there for the duration of the trial. In the other 20% of trials (lowPT trials), a target was displayed at the start of the trial but the location of the target unexpectedly switched sides shortly (∼300 ms) before movement onset (Fig. 1B). Experiment 1. A, Target layout. Two possible targets are located 8 cm from the start position and ±82.5° from the straight-ahead direction. B, Trial time line. Subjects heard four tones spaced 500 ms apart. A target appeared with the first tone and subjects were trained to initiate movement toward it synchronously with the fourth tone. In 80% of trials (highPT trials), the target remained in place throughout the trial. In 20% of trials (lowPT trials), the target was switched shortly (∼300 ms) before movement onset. C, Perturbation schedule. Subjects performed one block of trials with no perturbation and one block in which a 30° clockwise visuomotor rotation was imposed on the leftward target, followed by one block in which the perturbation was switched off. D, Trial-by-trial reach direction for a representative subject. Filled, red circles indicate highPT trials, and open, orange circles indicate lowPT trials. Inset shows the first 15 trials after perturbation onset (gray shaded region) in greater detail. Note that this subject failed to make an accurate movement on several trials, including the 11th trial after perturbation onset. In Experiment 1, we tested the effects of preparation time on the amount of learning expressed during adaptation and during washout. Ten subjects participated in this experiment. After an initial baseline period, a 30° clockwise rotation of the cursor was introduced in the left half of the workspace so that it only affected movements to one of the two possible targets (Fig. 1A,C). Figure 1D illustrates the main features of behavior in this paradigm with a representative subject. This subject showed little difference in performance during the baseline phase given different amounts of time to prepare their movement [red, filled circles (highPT) vs orange, open circles (lowPT)]. After 110 baseline trials, a rotation of the visual cursor position was introduced. This subject was able to successfully counter the perturbation within three trials of its onset (Fig. 1D, gray shaded region + inset). In the fourth trial, a lowPT trial, the subject was unable to maintain this compensatory behavior and their reach direction reverted back toward baseline. In the fifth, highPT trial, the subject was again able to compensate for the perturbation. This pattern continued through the next 100 trials: the subject was largely able to compensate for the perturbation in highPT trials, but exhibited poorer performance in lowPT trials. Performance in lowPT trials, did, however, gradually improve throughout the course of the block. During washout, the pattern of behavior was reversed: the subject reverted to baseline behavior in highPT trials, but displayed a persistent aftereffect in the lowPT trials. The key features of this representative subject's behavior were consistent across all subjects who participated in the experiment (Fig. 2A–C). The movements subjects made at baseline were not distinguishable between highPT and lowPT conditions: there was no significant difference in initial reach direction between lowPT and highPT trials to either the adapted target (trials 51–100, difference = 1.02 ± 3.7°; t(8) = 0.82; p = 0.43) or the nonadapted target (difference = 1.44 ± 3.21°; t(8) = 1.347; p = 0.22). Peak velocities were comparable across highPT and lowPT trials (trials 51–100, highPT: 1.04 ± 0.36 ms−1, lowPT: 1.01 ± 0.34 ms−1; within-subject difference: 0.028 ± 0.063 ms−1; t(8) = 1.355; p = 0.212). A, Perturbation schedule (see also Fig. 1C). B, C, Mean initial reach direction across subjects throughout the experiment to the unadapted target (B) and the adapted target (C). Filled red circles show highPT trials, and open orange circles show lowPT trials. The x-axis reflects approximate trial number within session. D–F, Scatter plots showing individual subject behavior during early learning (D), late learning (E), and late washout (F). Data points reflect average reach direction across the relevant shaded regions in C. G, Estimated contribution of the additional process recruited on highPT trials, obtained by subtracting lowPT from highPT performance. Shaded regions indicate ± SEM. Asterisks indicate significant difference in behavior between highPT and lowPT trials: *p < 0.05, **p < 0.01, ***p < 0.01. n.s. denotes a nonsignificant comparison. When a 30° clockwise rotation of the cursor was introduced in the left half of the workspace, subjects rapidly adapted their initial movement direction to compensate (Fig. 2C). Average behavior in highPT trials reached an asymptote after ∼30 trials. Behavior in lowPT trials, by the same subjects in the same block, changed much more gradually. Subjects exhibited significantly greater error in lowPT compared with highPT trials during early learning (trials 11–25, t(8) = 2.548; p < 0.05). Performance in this period was uncorrelated between lowPT and highPT trials (r = 0.097; p = 0.80; Fig. 2D), suggesting that poorer performance in lowPT trials was not simply due to a fixed fraction of overall learning being expressed in those trials. Notably, performance in highPT trials during this window appeared to be considerably more variable across subjects than behavior in lowPT trials (highPT SD = 13.4°; lowPT SD = 6.2°). Although performance in highPT trials quickly reached an asymptote, behavior in lowPT trials continued to improve gradually and was comparable to highPT trials at the end of the Adaptation block (trials 86–100, t(8) = 1.35; p = 0.22; Fig. 2E). The perturbation was removed early in the next block (Washout). In highPT trials, subjects' reach directions rapidly returned to baseline. Behavior in lowPT trials, however, revealed a significant aftereffect (trials 86–100, t(7) = −5.92; p = 0.001), which persisted until the end of the experiment 90 trials later (Fig. 2F). Critically, the overall pattern of behavior we observed, across initial learning and washout, cannot be explained in terms of a single component of learning expressed to differing degrees. Although a single-component model could plausibly explain the pattern of behavior during initial learning (e.g., if subjects gradually become better at expressing this component at low preparation times), such a model, however, necessarily predicts that a return to baseline in highPT trials during washout would generalize fully to lowPT trials. Instead, we found that subjects exhibited a clear and persistent aftereffect in lowPT trials. This overall pattern of data is instead better explained in terms of two components of learning acting in parallel: one that can be expressed regardless of preparation time, and one that can be expressed only at high preparation times. These processes act in the same direction during initial learning, but in opposing directions during washout. We estimated the influence of the component of learning that was expressible only at long preparation times by subtracting performance on lowPT trials from the average performance on adjacent highPT trials (Fig. 2G). The contribution of this process was large early in learning but slowly declined to near zero with practice. It was re-engaged during washout and remained in effect throughout the remainder of the experiment, apparently compensating for a persistent aftereffect in the component of learning expressed in lowPT trials. In Experiment 2, we sought to determine which of the two components of learning identified in Experiment 1 is responsible for savings, i.e., faster relearning upon re-exposure to the same perturbation at a later time. We recruited 14 new subjects for Experiment 2. Experiment 2 followed a design similar to Experiment 1, except that subjects were exposed to the perturbation twice on successive days (Fig. 3A). The perturbation was applied to the rightward target, rather than the leftward target, to rule out any potential effects of limb biomechanics in the results of Experiment 1. 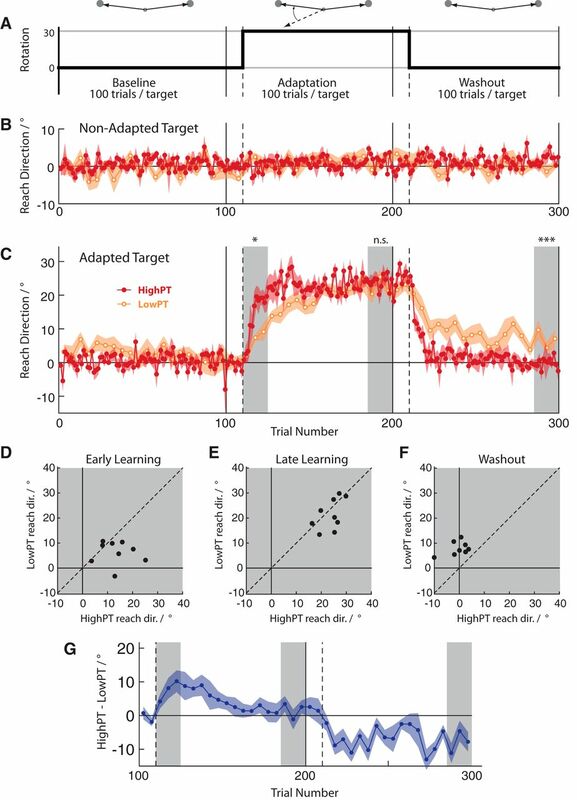 To minimize carryover of any aftereffects of learning to Day 2 (Krakauer et al., 2005; Joiner and Smith, 2008), initial learning on Day 1 was briefly washed out with 20 nonperturbation trials (to the adapted target) at the end of the session. Experiment 2 results. A, Perturbation schedule. Subjects were exposed to the perturbation on Day 1, but adaptation was washed out in the last 40 trials of the session. Subjects were re-exposed to the perturbation the next day, then washed out again. B, C, Mean reach direction across subjects for unadapted target (B) and adapted target (C). HighPT trials are shown in red, and lowPT trials are shown in orange. The x-axis reflects approximate trial number within session. Shaded regions indicate ± SEM. Asterisks indicate significant difference in behavior between highPT and lowPT trials: *p < 0.05, **p < 0.01, ***p < 0.01. n.s. denotes a nonsignificant comparison. Behavior on Day 1 of Experiment 2 reproduced the results of Experiment 1 (Fig. 3B,C): we found significantly greater compensation for the rotation in highPT trials than in lowPT trials during early learning(trials 11–25, t(13) = 4.131; p = 0.001). This difference became negligible later in learning (trials 66–80, t(13) = 1.44; p = 0.16). During washout at the end of Day 1, lowPT trials exhibited a greater aftereffect than highPT trials (trials 91–100, t(13) = −2.26; p < 0.05). On the second day, subjects exhibited a small aftereffect from the previous day's learning in lowPT trials (Adaptation 1, trials 1–10 vs Adaptation 2, trials 1–10; t(12) = −2.290; p < 0.05). This aftereffect was, however, very small in size (2.9 ± 4.7°, ∼14%) relative to the overall change in behavior on Day 1. During adaptation, behavior on Day 2 was qualitatively similar to that on Day 1 (Fig. 2C). After onset of the perturbation, subjects exhibited rapid adaptation in highPT trials but only expressed a limited amount of this learning in lowPT trials (Adaptation 2 trials 11–25, highPT vs lowPT, t(13) = 4.34; p = 0.001). Late in learning on Day 2, performance became comparable across trial types (Adaptation 2 trials 85–100, t(13) = 0.18; p = 0.86). At the end of washout on Day 2, a clear difference in reach direction remained between highPT and lowPT trials (Washout trials 85–100, t(11) = −2.209; p < 0.05). The critical question, however, is how learning compared across days within each trial type. We analyzed savings in terms of learning rate, taking into account the potential biases present at baseline, particularly in lowPT trials. We quantified the learning rate based on the change in behavior immediately before and after the perturbation was introduced (trials 11–15 and trials 6–10). We found that learning rate in highPT trials was significantly greater on Day 2 compared with Day 1 (highPT, Adaptation 1 learning rate vs Adaptation 2 learning rate, t(12) = −4.398; p = 0.001; Fig. 4A,B). This saving effect was, however, absent in lowPT trials (lowPT, Adaptation 1 learning rate vs Adaptation 2 learning rate, t(9) = −0.260; p = 0.801; Fig. 4C,D). Power calculations (assuming an effect size of 6°, approximately half that seen in highPT trials, and variability estimated based on data in Experiment 1) suggested that 8 subjects would be a sufficient sample size to achieve a power of 0.8 at a significance level of 0.05, whereas our sample contained 10 subjects after exclusions for missing switch trials. The difference in the extent of savings between lowPT and highPT trials was further supported by a significant Learning Rate × Trial Type interaction (Adaptation 1 learning rate vs Adaptation 2 learning rate, highPT vs lowPT, t(8) = 3.503; p < 0.01). Savings, therefore, could only be expressed when sufficient preparation time was available. Comparison of learning across sessions. A, Mean reach direction in highPT trials on Day 1 (gray) and Day 2 (red). B, Difference in state of learning expressed in highPT trials across days. C, Mean reach direction in lowPT trials on Day 1 (gray) and Day 2 (orange). D, Difference in state of learning expressed in lowPT trials across days. The x-axis reflects approximate trial number within session. Shaded regions indicate ± SEM. Asterisks indicate significant comparisons: *p < 0.05, **p < 0.01, ***p < 0.01. n.s. denotes a nonsignificant comparison. The results of all of our analyses did not change substantially if we log-transformed the data to control for differences in variability across subjects between lowPT and highPT trials. In particular, reach direction during early learning was closer to baseline in lowPT than highPT trials (Experiment 1: trials 11–25, t(8) = 2.232, p=0.056; Experiment 2: trials 11–25, t(13) = 4.073, p = 0.001). This analysis also confirmed that savings was stronger in lowPT than highPT trials (trial window (6–10 vs 11–15) × type (lowPT vs highPT) interaction; t(8) = 2.315; p < 0.05). In summary, savings was found only in components of learning expressed at high preparation times. Behavior at low preparation did not show any change in learning rate across days. The only evidence for long-term memory in this component was a small (∼3°) directional bias that persisted throughout the second session. We have demonstrated the existence of two qualitatively distinct components of motor learning that can be dissociated from one another based on the amount of preparation time that they require. One component of learning failed to be expressed on trials in which subjects were forced to move following a very short preparation time, while a second component could be expressed regardless of the amount of preparation time available. Our findings corroborate and extend previous work showing a relationship between preparation time and adaptation (Fernandez-Ruiz et al., 2011). However, a key novelty of our approach was to vary preparation time on a trial-by-trial basis, enabling us to assess the contribution of both components of learning in parallel in the same subject during a single exposure. Similar reduced expression of learning occurs if movements are elicited through startle (Wright et al., 2011). Our results suggest that this effect is attributable to the fact that startle shortens reaction times (Valls-Solé et al., 1999), rather than to any qualitative differences in how startle-elicited responses are generated. Importantly, startle is also known to affect behavior in a similar way following force field adaptation (Wright et al., 2009), showing that the effects of preparation time on expression of learning are not specific to visuomotor adaptation. A potential alternative explanation for our results is that there is only a single learning process (rather than two), but that the target switch in lowPT trials served as a contextual label (Howard et al., 2012), which allowed learning to occur independently in the two different types of trials. The slow time course of learning in lowPT trials may therefore simply be because of the lower frequency of those trials. Inconsistent with such a theory, however, we saw clear evidence of learning on the very first lowPT trial following movement onset (Figs. 2C,3C). Furthermore, previous work has observed similar effects of preparation time on expression of adaptation despite using either far more (Fernandez-Ruiz et al., 2011) or fewer (Wright et al., 2011) trials in which preparation time was limited. Added to the fact that characteristics of learning (aftereffects and savings) were qualitatively different in each trial type, we believe that our results cannot be adequately explained by a contextual effect, and are most parsimoniously explained in terms of selective expression of distinct underlying components. We exploited this effect to better characterize the nature of savings. We found that prior experience with a perturbation only affected the rate of subsequent learning in components that require a high preparation time to be expressed. We also observed a small but persistent aftereffect of prior learning in the lowPT trials on Day 2, similar to effects that have been reported before (Joiner and Smith, 2008; Villalta et al., 2013). Our results clearly dissociate this aftereffect from savings. Although the aftereffect could be construed as a form of long-term memory, it was of limited utility to subjects; the magnitude of the aftereffect (∼3°) is too small to account for the savings seen in highPT trials (∼10°). This bias effect therefore appears to reflect a more limited form of long-term memory than the more flexible memory associated with savings. Learning behavior in highPT trials varied significantly across subjects and across learning sessions. In contrast, behavior in lowPT trials was relatively stereotyped across subjects (Fig. 1D) and across exposures (Experiment 2; Fig. 4C). Subjects who could compensate well for the perturbation early on in highPT trials did not necessarily exhibit faster learning in lowPT trials. Importantly, this implies that the component of learning expressed in lowPT trials is insensitive to task success. Such insensitivity to success is characteristic of a well characterized implicit learning process driven by sensory prediction errors (Mazzoni and Krakauer, 2006; Taylor et al., 2014). This learning is cerebellum dependent (Taylor et al., 2010) and is thought to reflect updating of an internal forward model (Wolpert and Miall, 1996; Bastian, 2006; Izawa et al., 2012). We suggest that this process corresponds to the component of learning seen at low preparation time. The second component we identified, which could be expressed in highPT trials but not lowPT trials, may reflect explicit cognitive contributions to learning (Keisler and Shadmehr, 2010; Benson et al., 2011; Fernandez-Ruiz et al., 2011; Taylor et al., 2014). This component could be based on a cognitive model of the perturbation (Fernandez-Ruiz et al., 2011), or might reflect a search for actions that can cancel the effects of the perturbation. The nature of learning in this component may be qualitatively different from that expressed at low preparation time. Variability appears to play a critical role in this component of learning: lengthening preparation time increases variability as well as learning rate (Fernandez-Ruiz et al., 2011). Variability is also greater in explicit contributions to learning compared with implicit contributions (Taylor et al., 2014). This variability may be indicative of exploration by a learning system that relies on scalar outcomes rather than vector error (Stafford et al., 2012; Wu et al., 2014). 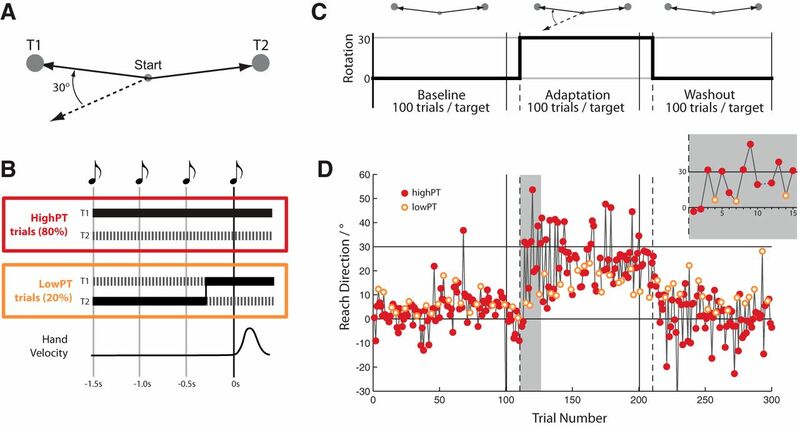 Our timed-response target-switch paradigm, inspired by the work of Ghez et al. (1997), was devised as a means to elicit movements at minimal preparation time. Low-latency motor responses can also be elicited through perturbations to the arm (Pruszynski et al., 2008), to a controlled cursor (Day and Lyon, 2000; Franklin and Wolpert, 2008), or to a target (van Sonderen et al., 1988; Prablanc et al., 2003) during or immediately before movement. Goal-directed responses following such perturbations emerge within 100–150 ms (Franklin and Wolpert, 2008; Pruszynski et al., 2008; Yang et al., 2011). Close examination of such rapid motor responses has found that behavior guided by explicit knowledge occurs at relatively long latency. When a cursor representing the hand location is displaced during movement, an implicit compensatory response is initiated in ∼150 ms (Prablanc et al., 2003; Franklin and Wolpert, 2008). If subjects are instructed to override this natural response and instead move their hand in the same direction that they see the cursor move, they are able to do so only at much longer latencies (∼350 ms). The low-latency compensation for the initial cursor displacement still occurs and therefore seems to be involuntary. A similar pattern of behavior is seen in object interception, where overriding the natural choice of hand incurs a reaction time penalty (Perfiliev et al., 2010) and in saccades, where generating an antisaccade (away from a stimulus) requires a longer reaction time than a prosaccade (Unsworth et al., 2011). In general, therefore, it appears that motor behavior is supported by a combination of implicit (perhaps procedural; see below) responses that can be executed at short latency, together with more explicit contributions that can only be expressed at longer delays, consistent with our interpretation that behavior at long preparation times reflects explicit contributions to learning. A fundamental distinction in long-term memory is between declarative and procedural forms of memory. Although exact definitions vary, declarative memory is typically associated with knowledge that can be consciously recalled (though not necessarily verbalized; Stanley, 2011), while procedural memory relates to knowledge that can only be expressed by doing something (Squire, 1992). The distinction between these types of memory rests largely on dissociations in amnesic subjects, who can acquire new perceptual (Cohen and Squire, 1980) and motor (Corkin, 1968; Milner et al., 1998) skills without having any conscious recollection of doing so. More concrete definitions of procedural memory appeal to the computational idea that procedural memory corresponds to a cached mapping or control policy relating stimuli to actions (Dayan, 2009). According to this theory, procedural memories should be expressible at minimal preparation times. Indeed, formation of a procedural memory is generally established through reductions in reaction time (Nissen and Bullemer, 1987; Knopman and Nissen, 1991; Pascual-Leone et al., 1993; Jackson et al., 1995; Grol et al., 2006; Robertson, 2007). The fact that savings could not be expressed at low preparation times suggests, at least according to this definition, that it does not depend on recall of a procedural memory. Instead, the memory associated with savings might be better characterized as declarative. The component of adaptation expressed at low preparation times appears to resemble implicit, error-driven learning of the kind that appears to be supported by the cerebellum (Medina et al., 2001; Tseng et al., 2007; Taylor et al., 2014; Yang and Lisberger, 2014). Although this component of learning could be expressed at low preparation time, the only long-term memory it exhibited was a weak overall bias of reach direction on Day 2. We question the degree to which this bias effect can be considered a procedural memory of the kind that supports more complex and dynamic motor skills such as driving, juggling, or tying a shoelace. Therefore, contrary to widely held beliefs (Hikosaka et al., 2002; Doyon et al., 2003; Nguyen-Vu et al., 2013), cerebellum-dependent learning (at least as it is currently understood) may play a fairly limited role in the acquisition of complex skills and instead might primarily serve to maintain calibration of existing skills (Telgen et al., 2014). We thank Darya Task for assistance with data collection. We thank Aaron Wong and Jing Xu for helpful comments. This work was supported by NSF Grant 1358756. (2006) Learning to predict the future: the cerebellum adapts feedforward movement control. Curr Opin Neurobiol 16:645–649, doi:10.1016/j.conb.2006.08.016, pmid:17071073. (2011) A spatial explicit strategy reduces error but interferes with sensorimotor adaptation. J Neurophysiol 105:2843–2851, doi:10.1152/jn.00002.2011, pmid:21451054. (1980) Preserved learning and retention of pattern-analyzing skill in amnesia: dissociation of knowing how and knowing that. Science 210:207–210, doi:10.1126/science.7414331, pmid:7414331. (1968) Acquisition of motor skill after bilateral medial temporal-lobe excision. Neuropsychologia 6:255–265, doi:10.1016/0028-3932(68)90024-9. (2000) Voluntary modification of automatic arm movements evoked by motion of a visual target. Exp Brain Res 130:159–168, doi:10.1007/s002219900218, pmid:10672469. (2009) Goal-directed control and its antipodes. Neural Netw 22:213–219, doi:10.1016/j.neunet.2009.03.004, pmid:19362448. (2003) Distinct contribution of the cortico-striatal and cortico-cerebellar systems to motor skill learning. Neuropsychologia 41:252–262, doi:10.1016/S0028-3932(02)00158-6, pmid:12457751. (2008) Specificity of reflex adaptation for task-relevant variability. J Neurosci 28:14165–14175, doi:10.1523/JNEUROSCI.4406-08.2008, pmid:19109499. (1997) Discrete and continuous planning of hand movements and isometric force trajectories. Exp Brain Res 115:217–233, doi:10.1007/PL00005692, pmid:9224851. (2006) Cerebral changes during performance of overlearned arbitrary visuomotor associations. J Neurosci 26:117–125, doi:10.1523/JNEUROSCI.2786-05.2006, pmid:16399678. (2013) Model-based and model-free mechanisms of human motor learning. Adv Exp Med Biol 782:1–21, doi:10.1007/978-1-4614-5465-6_1, pmid:23296478. (2002) Central mechanisms of motor skill learning. Curr Opin Neurobiol 12:217–222, doi:10.1016/S0959-4388(02)00307-0, pmid:12015240. (2012) Gone in 0.6 seconds: the encoding of motor memories depends on recent sensorimotor states. J Neurosci 32:12756–12768, doi:10.1523/JNEUROSCI.5909-11.2012, pmid:22972999. (2012) Cerebellar contributions to reach adaptation and learning sensory consequences of action. J Neurosci 32:4230–4239, doi:10.1523/JNEUROSCI.6353-11.2012, pmid:22442085. (1995) Serial reaction time learning and Parkinson's disease: evidence for a procedural learning deficit. Neuropsychologia 33:577–593, doi:10.1016/0028-3932(95)00010-Z, pmid:7637854. (2008) Long-term retention explained by a model of short-term learning in the adaptive control of reaching. J Neurophysiol 100:2948–2955, doi:10.1152/jn.90706.2008, pmid:18784273. (2010) A shared resource between declarative memory and motor memory. J Neurosci 30:14817–14823, doi:10.1523/JNEUROSCI.4160-10.2010, pmid:21048140. (1991) Procedural learning is impaired in Huntington's disease: evidence from the serial reaction time task. Neuropsychologia 29:245–254, doi:10.1016/0028-3932(91)90085-M, pmid:1829141. (2006) Consolidation of motor memory. Trends Neurosci 29:58–64, doi:10.1016/j.tins.2005.10.003, pmid:16290273. (2006) An implicit plan overrides an explicit strategy during visuomotor adaptation. J Neurosci 26:3642–3645, doi:10.1523/JNEUROSCI.5317-05.2006, pmid:16597717. (1998) Cognitive neuroscience and the study of memory. Neuron 20:445–468, doi:10.1016/S0896-6273(00)80987-3, pmid:9539121. (2013) Cerebellar Purkinje cell activity drives motor learning. Nat Neurosci 16:1734–1736, doi:10.1038/nn.3576, pmid:24162651. (1987) Attentional requirements of learning: evidence from performance measures. Cogn Psychol 19:1–32, doi:10.1016/0010-0285(87)90002-8. (1993) Procedural learning in Parkinson's disease and cerebellar degeneration. Ann Neurol 34:594–602, doi:10.1002/ana.410340414, pmid:8215247. (2010) Reflexive limb selection and control of reach direction to moving targets in cats, monkeys, and humans. J Neurophysiol 104:2423–2432, doi:10.1152/jn.01133.2009, pmid:20810693. (2003) Neural control of on-line guidance of hand reaching movements. Prog Brain Res 142:155–170, doi:10.1016/S0079-6123(03)42012-8, pmid:12693260. (2008) Rapid motor responses are appropriately tuned to the metrics of a visuospatial task. J Neurophysiol 100:224–238, doi:10.1152/jn.90262.2008, pmid:18463184. (1996) Adaptive spatial alignment and strategic perceptual-motor control. J Exp Psychol Hum Percept Perform 22:379–394, doi:10.1037/0096-1523.22.2.379, pmid:8934851. (2007) The serial reaction time task: implicit motor skill learning? J Neurosci 27:10073–10075, doi:10.1523/JNEUROSCI.2747-07.2007, pmid:17881512. (2010) Multiple motor learning strategies in visuomotor rotation. PLoS One 5:e9399, doi:10.1371/journal.pone.0009399, pmid:20195373. (1992) Declarative and nondeclarative memory: multiple brain systems supporting learning and memory. J Cogn Neurosci 4:232–243, doi:10.1162/jocn.1992.4.3.232, pmid:23964880. (2012) A novel task for the investigation of action acquisition. PLoS One 7:e37749, doi:10.1371/journal.pone.0037749, pmid:22675490. (2011) Know how (Oxford UP, Oxford, UK). (2014) Cerebellar and prefrontal cortex contributions to adaptation, strategies, and reinforcement learning. Prog Brain Res 210:217–253, doi:10.1016/B978-0-444-63356-9.00009-1, pmid:24916295. (2010) An explicit strategy prevails when the cerebellum fails to compute movement errors. Cerebellum 9:580–586, doi:10.1007/s12311-010-0201-x, pmid:20697860. (2014) Mirror reversal and visual rotation are learned and consolidated via separate mechanisms: recalibrating or learning de novo? J Neurosci 34:13768–13779, doi:10.1523/JNEUROSCI.5306-13.2014, pmid:25297103. (2007) Sensory prediction errors drive cerebellum-dependent adaptation of reaching. J Neurophysiol 98:54–62, doi:10.1152/jn.00266.2007, pmid:17507504. (2011) Attention control and the antisaccade task: a response time distribution analysis. Acta Psychol 137:90–100, doi:10.1016/j.actpsy.2011.03.004, pmid:21470585. (1999) Patterned ballistic movements triggered by a startle in healthy humans. J Physiol 516:931–938, doi:10.1111/j.1469-7793.1999.0931u.x, pmid:10200438. (1988) Conditions determining early modification of motor programmes in response to changes in target location. Exp Brain Res 71:320–328, doi:10.1007/BF00247492, pmid:3169167. (2013) Extinction interferes with the retrieval of visuomotor memories through a mechanism involving the sensorimotor cortex. Cereb Cortex doi:10.1093/cercor/bht346, Advance online publication. Retrieved Dec. 19, 2013. (2011) IEEE International Conference on Rehabilitation Robotics: [proceedings] Startle reduces recall of a recently learned internal model, pp 334–339. (2009) Conference proceedings, Annual International Conference of the IEEE Engineering in Medicine and Biology Society Startle stimuli reduce the internal model control in discrete movements, pp 4590–4594. (2014) Temporal structure of motor variability is dynamically regulated and predicts motor learning ability. Nat Neurosci 17:312–321, doi:10.1038/nn.3616, pmid:24413700. (2011) Rapid motor responses quickly integrate visuospatial task constraints. Exp Brain Res 211:231–242, doi:10.1007/s00221-011-2674-3, pmid:21503648. (2014) Purkinje-cell plasticity and cerebellar motor learning are graded by complex-spike duration. Nature 510:529–532, doi:10.1038/nature13282, pmid:24814344.